What to do? – Nutrition.Health.Life. People ask me tons of questions about eating. What is the perfect breakfast? Do I need breakfast? 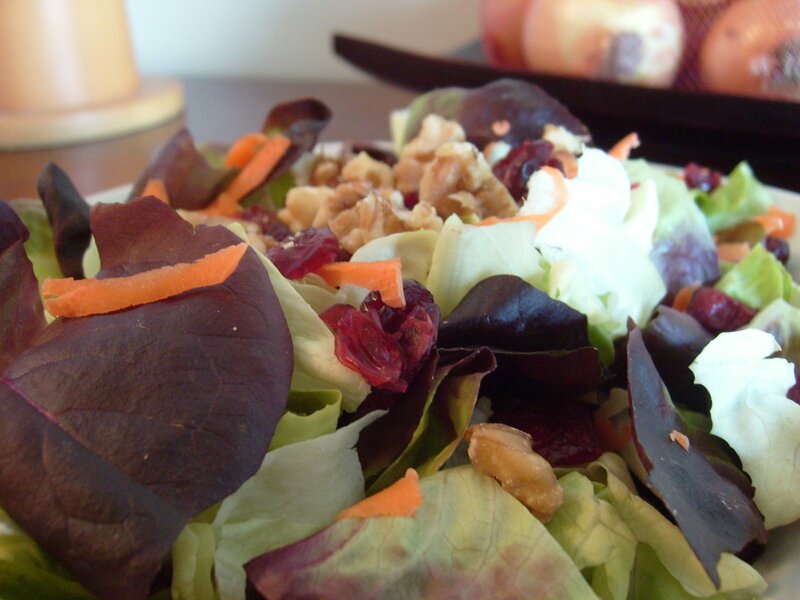 What should I eat to lose weight? What should I eat to gain muscle? How often should I eat? How much should I eat? 1. Eat Intuitively: eat when you are hungry, stop when you are full. While you can “live to eat” the most important thing is to “eat to live.” While something might taste good, when you are full you should stop – is that overstuffed feeling really worth it? Granted, this is easier said that done (I know from many personal experiences), the more you do it, the easier it becomes. 2. Eat at home: I strongly believe that our desire to eat out all of the time is why our country is so obese. A dinner out once and a while is fine but most Americans eat out multiple times a week. When you eat out you have no control over what goes into the food or how much food you are getting. When the waitress shows up with the over-sized double cheeseburger and unlimited fries, you are bound to violate recommendation number one. We seem to think that eating out is quicker than making a meal at home, but by the time you get to the restaurant, review the menu, order your meal, and wait for the food to come, about 40 minutes has passes and you could have made about 1/2 of the items on this blog. 3. Eat like your grandparents did: Although the media has come to tell us that things like steak and potatoes are “bad” for us they are not. Look at our grandparents – they were not all overweight in the 1940s and 1950s. But how could this be…they ate things like cream, and butter, and red meat, and potatoes??? They did not over indulge like we do today, they were more active, and they ate food that was closer to its natural source. They didn’t eat processed and breaded chicken patties from the local supermarket or a burger with a brat patty on it covered in cheese (yes, this is available at Curly’s Pub at Lambeau Field in Green Bay, WI). They ate chicken and steak from the butcher. Sure they put butter on their potatoes, but they didn’t have over-sized potatoes covered with 2 TBSP of butter, 1/4 cup of sour cream, a handful of bacobits, and 2 ounces of cheddar cheese. 4. Exercise: While this has nothing to do directly with eating, it is important. It is as simple was walking for 10 minutes 3 times per day. We don’t move around enough in our super-connected world. Why would we need to? We could work from our desk at home and have the local grocery store deliver our food. We can drive anywhere and can even get food brought to our car so we never have to move our legs. We have become obsessed with convenience and feel there is not enough time in the day to exercise. Looking at the big picture, wouldn’t you prefer to prevent a plethora of diseases by sacrificing 30 minutes of TV and going for a walk with the family? These three recommendations are things most people know but do not want to hear. Many people I talk to want to hear that they can eat fast food and not exercise but still loose weight and look like a celebrity. The reality is that it takes some time to break away from the norm of fast food and a sedentary lifestyle. If you are overweight, it will take some time to reach a healthier weight – how long did it take for you to get where you are? I am guessing it wasn’t overnight. You may never reach what medicine calls a “healthy weight” because of the changes that have occur ed to your body over the years (if you want to know more about this feel free to email me or leave a comment and I will get back to you) but you can be healthier than you are. I promise that if you do the things above you will lose weight and feel better. These pictures are of a dinner Jason and I had for Valentines Day. Sure, we could have spent $60 for dinner and wine for two on this special holiday, but we chose to make dinner together and eat at home. We bought good steaks from the local butcher and a nice bottle of wine. 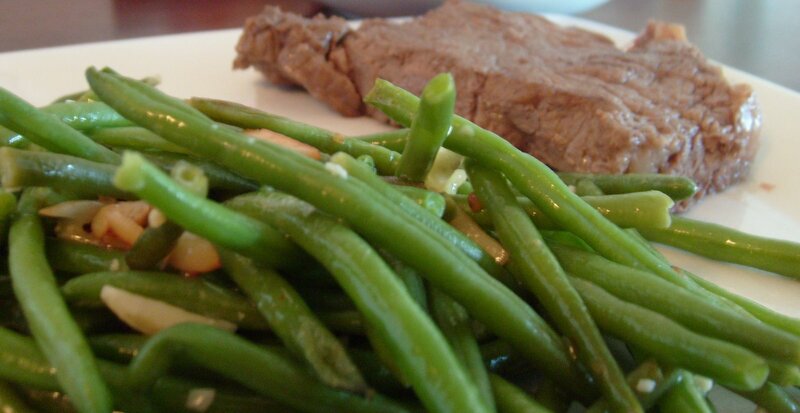 We also made a simple salad with dried cranberries, and some sauteed green beans with slivered almonds. I can guarantee that this meal was healthier and cheaper than any meal we would have got at a restaurant, and making it was half of the fun! Everyone has the power to be healthier. It just takes a little direction and a lot of motivation. At first it is difficult and almost unconventional, but after a short while it is extremely satisfying knowing that you are treating your body the way it was suppose to be treated. This entry was posted in Health Information. Bookmark the permalink.